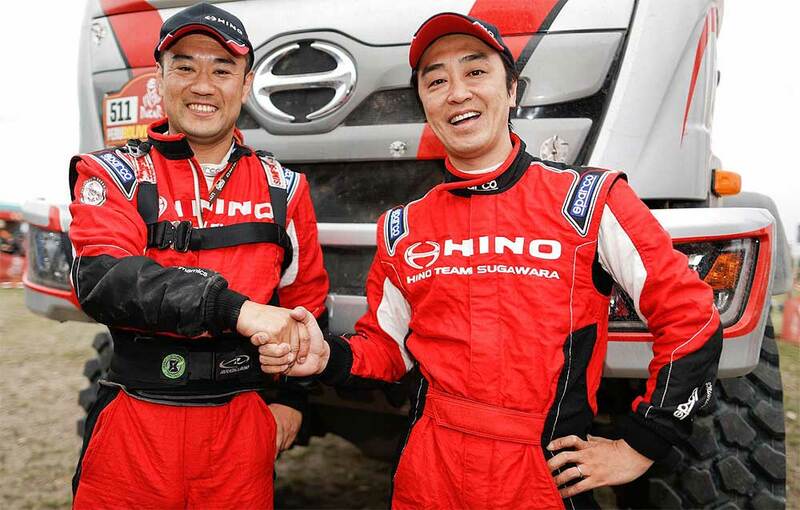 In the early stages of the Dakar 2018, Japanese Hino Team Sugawara was left with only one of the two Hino 500 Series trucks that they entered due to an ill-fated problem which forced the Hino crewed by Senior Yoshimasa Sugawara and Katsumi Hamura to withdraw from the race. Nonetheless, the Teruhito Sugawara and Mitsugu Takahashi crew in the second Hino delivered stunning performance, achieving the team's 9th straight win in the Under 10-litre Class, and beating out many of its larger rivals powered by 10 litre-plus engines for a ranking at 6th place overall (accumulated). Hino chairman, Yasuhiko Ichihashi, was present at the goal venue to congratulate the team's mechanics and staff members as well as show his appreciation for the work that they had put in over the past year. "I am very happy that the team was able to fulfill their goal of winning their 9th straight win in the Under 10-litre Class," Ichihashi said. "While Truck 1 had to withdraw from the race, I'm glad that Truck 2 was able to deliver the results that we had hoped for. We intend to continue our various activities as Hino Motors." Dakar-legend Yoshimasa Sugawara summarized: "Although this event turned out to be a huge failure for me, I am going to leave all of that behind and get to work to enter the rally again next year. I think Teruhito did really well this year considering the very difficult courses that we were all up against this year." His son Teruhito Sugawara, pilot of the finishing Hino, said after the race: "I had a great time every day as we faced a succession of difficult courses back to back, and raced in many areas that we'd never been to before. This was the 20th Dakar Rally for me personally, and I'm glad that we were able to achieve the results that we aimed for. I think we were able to make the best of our current potential so it was very satisfying in that respect too. Right now, I'm just relieved."